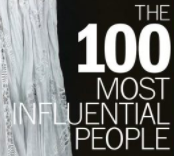 Time Magazine published its annual list of the 100 most influential people in the world called TIME 100. The leaders of China, United States, North Korea, Canada, Bangladesh, Japan, and France were all on the list. The CEOs of Microsoft, Tesla, and Amazon were on the list. The figure skater Adam Rippon, “Me Too” movement founder Tarana Burke, tennis player Roger Federer, snowboarder Chloe Kim, television host Trevor Noah, actress Millie Bobby Brown, and cricketer Virat Kohli were also on the list. TIME 100 was first published in 1999. You can view this year’s list here.